So lets talk about boosts or rather the lack of them! 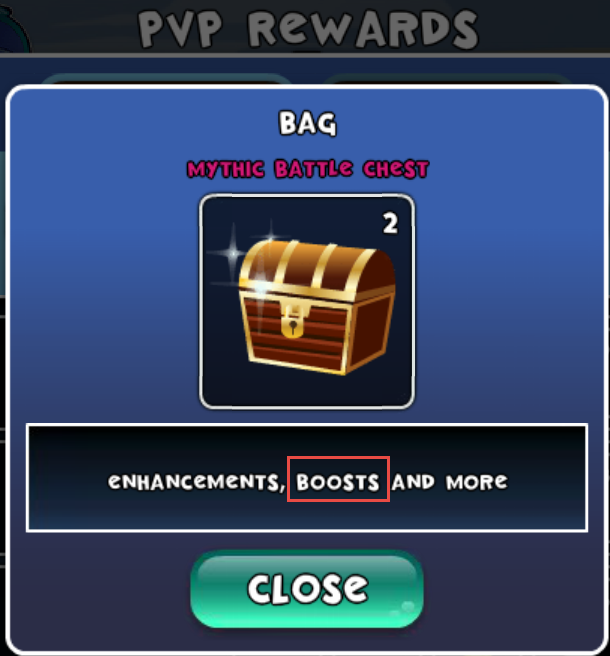 You can clearly see that boosts are included in PVP chests. In reality it's just a meaningless word in reward description. I didnt see a single boost drop from that chests around 4 months. In the past, before you've added enhancements to chests, boost drop looked like — 90% useless element shields and 10% something valuable. Now its 0% as far as boosts drop goes! So why you cant ballance those things, why you rush from one extreme to the other? Also yesterday i bought some boosts from the shop and guess what... i didnt get what i was after! We are aware that the rewards system needs a revamp. Chests and it's rewards (boosts and enhancements) will definitely be looked at. As usual... not a single bluepost. I'll keep it in mind. I put some spaces to make more readable, but they didn't show up. I don't know why. I wrote from a smartphone. What do you mean in the boost shop section, can you say with more details? I'm also disappointed in pvp chests reward, the best reward I got once was 1 k gems, 2 or 3 times APs and coins reward. Mostly I get enchantment reward, and mostly healing enchantments which are useless. Damage and health enchantments are ok. But I see a problem with enchantments, we get them as a reward and if we want to use them we have to pay additionally 20k, 10k or 5k of coins. I need coins for evolving curios, upgrading boosts, I don't have any coins left for enchantments. Now you introduced enchantments to the shop and we have to spend gems and after that coins to use them. I collected a lot of enchantments and I can't use them. So if I get enchantments as a reward from pvp chest, I actually get useless things. Disappointed. Please modify the percentage of drops in the chests and please write a list with things we can get and their percentage like you did with cw and cvc chests rewards.